Spread some Giggle in the world – Stones, and Tokens, and Hearts, Oh My! Who doesn't love Sunflowers and Giggles? And, there will be many more on the way! Our “Word of the Month” for August is “Giggle”. Sunflowers make me giggle they are just so big, bright and well, HAPPY!! Having some friends over for dinner, or your book club meeting, or just want to share some happiness at the office? Here’s a hint, try this on a Monday when everyone is geared up to be grumpy. 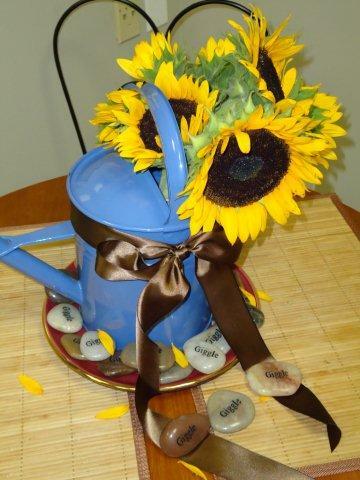 Show up with your Sunflower Arrangement that you put in a watering can. Add some of our “Giggle” River Rocks to the base and let everyone know to take one home with them, or keep one for their desk. who doesn’t like receiving a little “Giggle”? You can’t help but do exactly that when you look at one! If you’re using this project for your home, then your friends and family get a wonderful reminder of what a wonderful time they had when they came to visit. I’m thinking GREAT idea to get off on the right foot with the first PTA meeting of the year. People are much more likely to volunteer if you butter them up with something first!! You’ll be the most popular person in your office/book club meeting/dinner party! All thanks to some “Giggles”.